I'm long gone from the Cape, but a blog savvy publicist from the Travel Channel dropped me a line to let me know that I might have given New England's beach paradise short-shrift -- and that I should tune in tonight to catch travel guru Samantha Brown taking her own tour of Cape Cod. Now, I've seen the Cape, but perhaps you'd like a technicolor gander. If so, Samantha Brown's Cape Cod Passport To Great Weekends episode airs tonight -- Thursday, August 28th at 10:00 pm EST. 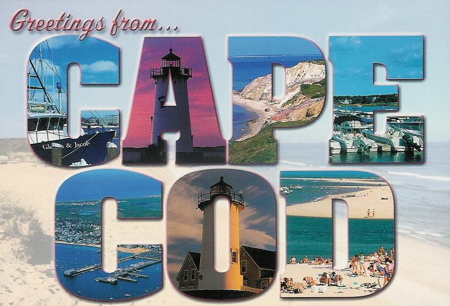 And you can even check out her travel guide for Cape Cod online ahead of time. Couldn't help but notice though that neither the Swan Seafood Restaurant nor Chatham are on Samantha's hot spot list. Clearly, she missed out on the real Cape. If you ever get back to Cape Cod, you must go to the Cottage Street Bakery in Orleans. It's just off the rotary across the street from the Christmas Tree Shop. My husband and I rent the little cottage attached to the bakery in the spring. It's our little hideaway on the cove in Orleans.